This sandwich is SO crazy good and I’ll tell you why. First, you’ve got your toasted Cinnamon Raisin Ezekiel bread – so good! Great texture, nice and hearty with just a kiss of sweetness. Then you’re got your mashed avocado that is not only rich and creamy but is packed with healthy fats too! Top that with some lean sliced turkey breast which adds yet another texture and a bit of salty goodness and you’ve got a simple super sandwich to die for. There is just something about the salty-sweet combo with the rich and creamy avocado that is seriously gonna knock your socks off! But don’t try skipping the cinnamon raisin bread because this baby is a major player in our super sandwich (it’s ALL about the salty-sweet thing). Not to mention your getting some good complex carbs, with some lean protein and healthy fats in this one simple super sandwich! Balance at it’s best. So there ya have it… a little more proof that you can create nutritious and delicious with very little time and very little effort! Do you guys have any stupid simple super sandwiches that you like or make? If so, share your ideas in the comments! Pop the Ezekiel bread in the toaster and get it good and toasty. Mash up the avocado with the back of a fork and then smear onto your toasted bread. 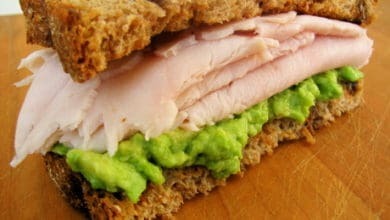 Add a little pinch of salt to the avocado and layer on your turkey. Close it up, take bite, smile!! Perfect timing. You just inspired my lunch! Though now I wish I had some of that cinnamon raisin bread. I only have the plain at home. Did you make guacamole, or just mash up the avacado? Amy – I’m sure it will still be d’lishes but when you get a achance you HAVE to try it with the cinnamon raisin bread. the problem here for me is one more time to find the ingredients..in this case the bread. but my favorite sandwich is some whole wheat spelt bread with goat cream cheese that I mix with chopped anchovies, chopped black olives and chopped arugula. spread it on the bread , few slices of tomatoes and I just love it. Really good. I like your idea too, especially because of the sweet and salty thing. great. That sandwich looks good! Nice shade of green. Toast some regular Ezekiel bread. yummmmmmmmmm! 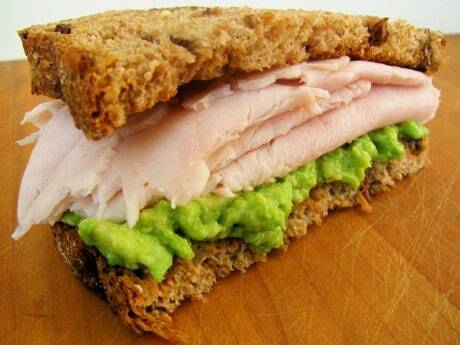 I adore avocado…and boy does that sammy look AWESOME! Made it the past two days for lunch. So yummy, can’t get enough of it. Thanks. Jen516@hotmail.comThis looks great! My fav is a walnut bread with goat cheese, apples, avocado, and alfalfa sprouts. I must admit, I was skeptical. CINNAMON-RAISIN BREAD with TURKEY? But I had it for lunch today, and I’ve been thinking about it ever since. It’s SO simple. I think the Ezekiel bread is key, because it’s not artificial-syrupy sweet. It is, like you said, a “kiss” of sweetness — sweet on the outside but savory and creamy on the inside. Ruth – Have you tried ordering those items from Amazon – I’m pretty sure they are both available! When I saw the picture of that bread all I could think was “I have to have the bread!” haha. This looks amazing, can’t wait to try it! How does something so simple look so good?!? I wouldn’t have thought to marry the cinnamon raisin bread with the turkey. But I’ll take your word and not skip it! This post, which I found a looong time ago, inspired my favortie breakfast ever… Cinnamon Raisin English muffin with turkey, avocado and apple! Filling and delicious — thanks for the inspiration! I never would have thought of using the cinnamon raisin! There’s a restaurant here in town that makes a sandwich similar to this known as a “Turkey, Avocado and cream cheese” sandwich. They include some fresh alfalfa sprouts on the top of the sandwich as well. I’m wanting to make my own healthy version of this sandwich minus the ridiculous thick slice of cream cheese they put in theirs. I’m thinking maybe using greek yogurt as a sandwich spread but not sure how I’d make it taste right. Any ideas?